I hope you are having a great weekend so far! 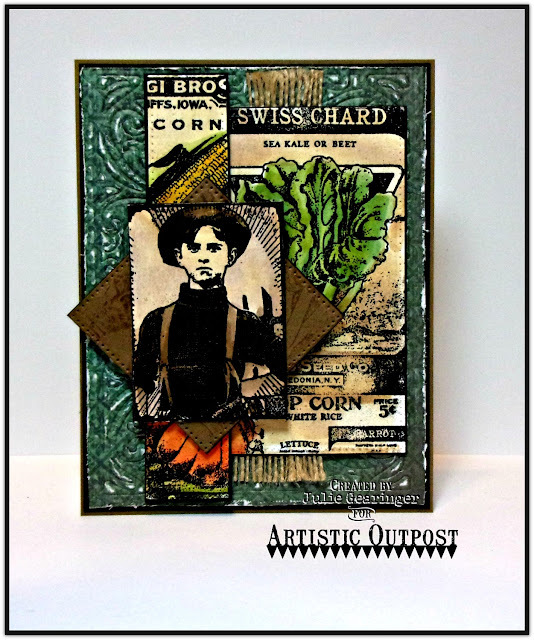 I had a chance to stamp today and decided to create a Mixed Media card using stamp sets from the 2016 Artistic Outpost Release, Harvest and Seed Packets Background, available from Our Daily Bread Designs. I decided to incorporate the Mojo Monday Mojo464 Sketch Challenge as well as the Mixed Media Card Challenge #27 “Harvest Basket” Challenge into the design. 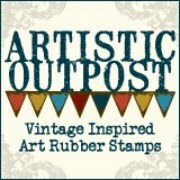 I hope you have a chance to stop by the Artistic Outpost blog to check out the different projects posted throughout the month from the rest of the AO Design Team as well as the challenge sites- fabulous inspiration from all!! Emboss a piece of the Our Daily Bread Designs (ODBD) Christmas 2013 Collection 6x6 Paper with theODBD Vintage Flourish Pattern Dies, distress the edges and use a sanding block to lightly sand the embossing. Mount onto a piece of black cardstock, trim close to the panel and mount onto the brown card base. Stamp and emboss the AO Seed Packets Background stamp with black embossing powder on white cardstock, die cut and emboss with the ODBD Pierced Rectangles Dies (the long, narrow piece was the scrap and I re-positioned it back into the die to die cut and emboss the other side). Color the embossed images using ink from water-based markers and a water brush (I scribble the markers on my craft mat and use the ink to watercolor). Add marker directly to the images as needed for shadows and use distress ink for the “aging” of the paper. Mount the panels onto black cardstock, trimming close to the die cut. Add the frayed burlap ribbon to the card front and mount the Seed Packets main panel directly to the card front. Add the narrow strip from the AO Seed Packets panel using dimensional foam (I actually cut the strip in half and hid the cut edge behind the main focal image panel). Die cut and emboss a piece of brown cardstock with the ODBD Pierced Square Dies and stamp the AOSeed Packets Background stamp with distress ink and stamp over the die cut. Mount the die cut square onto black cardstock and trim close to the edges. Stamp and emboss the AO Harvest farmer image with black embossing powder, “age” with distress inks and mount onto black cardstock (trimming close to the edge). Add this image to the square die cut and mount onto the card front with dimensional foam to finish off the card. Thanks again for stopping by to visit- I am so encouraged by all of you! Hugs and have a blessed week, my friends! Such a cool card! Thanks for playing along with Mojo Monday! So many details to love. So perfectly executed. 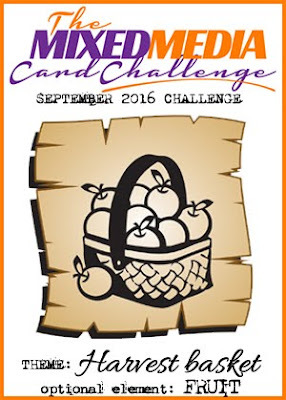 I love your take on our harvest challenge. Thanks for joining us at the MMCC this month. Lots of lovely details; the layered elements look so cool! Thank you for playing with us at MMCC!